4/10/2014–Burlington, NC–On the last weekend in March, the Middle East Region held its annual Cadet Competition. There were five Color Guard and four Drill Teams competing. 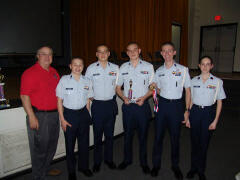 The North Carolina Wing took home many honors including overall first place in the color Guard competition, and second place in the Drill competition. Lt. Col Phillis Griffin, MER cadet competition project officer, released the following statement after the competition: "I want to thank all the competitors for a great competition this year. We tried a couple of new things this year because there will not be a national competition. I hope everyone had a great time and will be getting ready for next years competition." CCol. Larry Ragland, MER Commander, was on hand during the competition and was able to spend a few minutes with each of the winning teams at the awards ceremonies. Col. David Crawford,NC Wing Commander, when notified of their victory offered, "These young men and women have worked very hard over the last year, and their efforts have paid off. I couldn't be more proud of their accomplishments this weekend."